grease, oil, dirt, soot, other nasty solidified unguents, or any combination thereof. The removal of these accumulated layers is a labor and time intensive task that is made all the more frustrating by the lack of specialized tools or supplies, and the high potential for damaging the firearm in the process. This is not to say that there aren't high quality cleaning supplies available; one can buy bore cleaners, bore pastes, oils and greases each day for the next ten years and never duplicate a purchase. Indeed, one can mortgage a house on patches, rods, wipes, and snakes. But none of this really addresses the need. One man who understands the need AND has been addressing it since about 1969 is Bill Nelson. Bill is the owner of the Big 45 Frontier Gunshop (605-574-4702), located in Hill City, South Dakota. Bill opened the shop in 1969 in Valley Springs, South Dakota and moved it to Hill City in 1992. 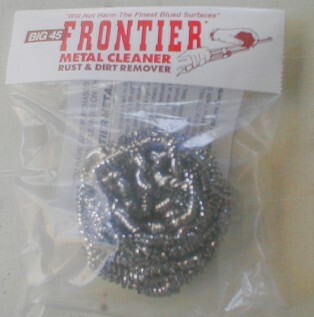 One of the shop's staple products since it opened has been "Frontier Metal Cleaner." Looking a lot like a steel scrubbing sponge made up of thin coiled ribbons of metal, the cleaner marries the results of painstaking metallurgical experimentation with a clear understanding of the problem at hand. The coils are composed of a proprietary alloy containing stainless steel, nickel silver, monel (a corrosion resistant nickel based alloy), and zinc. The alloy is effectively "harder than rust but softer than bluing." As a result it can be used to scrape the rust, dirt, and dried greases and oils off blued steel without harming the finish. Moreover, Frontier Metal Cleaner is significantly more effective than other "sponge" cleaners like bronze wool due to the shape of the individual strands. Since each strand is a thin, ribbon of metal with sharp leading and trailing edges, the "sponge" has the effect of hundreds, if not thousands of small razor blades scraping away at surface build up. Steel or bronze wool, which is round in cross section does not have this advantage. When using the cleaner, one needs to have some soft, clean cloths on hand as well as some sort of lubricant oil. According to Bill, the best way to begin using the cleaner is the gun removed from the stock and the metal parts wiped dry of all oils and solvents. The metal to be cleaned is rubbed with the cleaner as though being polished for fifteen to twenty strokes. At that point, the metal is wiped down with the cloth to remove the loosened grime and rust - be prepared for your cloths to turn a dark, rusty black very quickly! The process is repeated until the wiping cloths begin to lighten in color. At this point, the metal is oiled to improve lubricity, and the process continued. Eventually, the rust and surface grime will be gone, leaving only the original finish. To add to the cleaner's versatility, it is extremely effective at removing lead deposits from the bore, and goes a long way toward cleaning copper buildup as well. To use the cleaner on the bore, cut a small piece off the pad with a scissors (do NOT try to break it with your hands - you'll soon have very cut up fingers to show for it.!). Wrap the strands around and through a bore brush, and then run the brush through the bore as usual. Curious as to the cleaner's efficacy, we decided to try it out. A CRUFFLER.COM staffer had recently come into a 112 year old Mauser Model 71/84 rifle. While the rifle had a pristine bore, and all serial numbers matched, the exterior was coated with a combination of powdery rust, dried grease, and grime that refused to yield to the conventional treatments of solvents and elbow grease. More importantly for test purposes, the underside of the barrel held an unblemished example of the rifle's original bluing. The rifle was broken down into individual components and taken out of the stock. After using the cleaner for about fifteen minutes, we had a pile of absolutely black crumpled paper towels. It took another three hours of careful work to clean the barreled receiver, but when it was done, we were amazed. Not only was there not a speck of rust or dirt on the metal, but it was as if years had melted from the gun. While showing some wear, the blued parts looked as if they belonged to a well used, but lovingly cared for piece. The bare metal parts showed some browning, but were smooth, with perfectly preserved markings. The original bluing on the barrel's underside was pristine. The pads are quite durable, and can be cleaned quite well with a quick drying spray solvent like Birchwood Casey Gun Scrubber. At $4.00, post paid each, they should form an indispensible part of any cruffler's toolkit!